The following post is kindly provided by Jamie Huston, author of the blog Gently Hew Stone, where it was previously published. The points he makes are straightforward and valuable, and set the stage for some upcoming discussions of the important work of Brian Stubbs, particularly his new book, Changes in Languages from Nephi to Now (Blanding, UT: Four Corners Digital Design, 2016) and his 2016 FAIRMormon Conference presentation, "Changes in Languages from Nephi to Now." 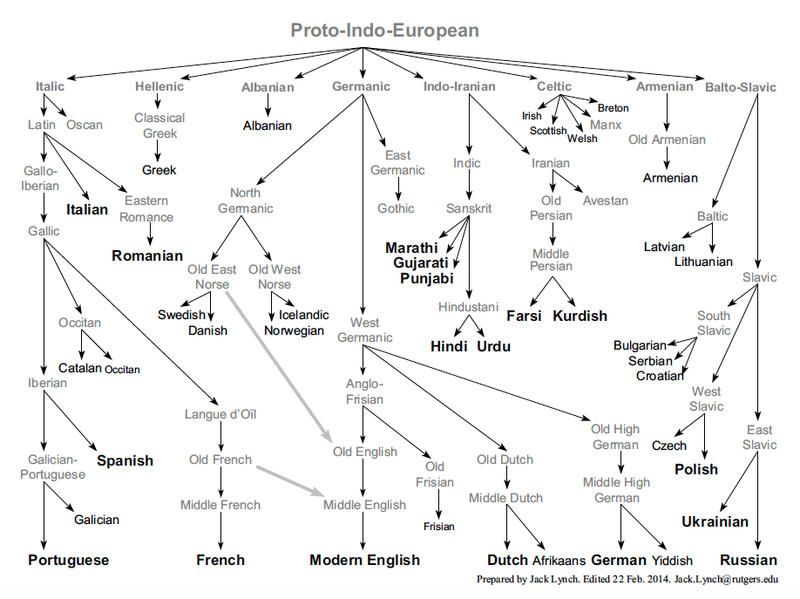 Going back through history, we see that many languages ranging from Western Europe even to India have such roots in common. 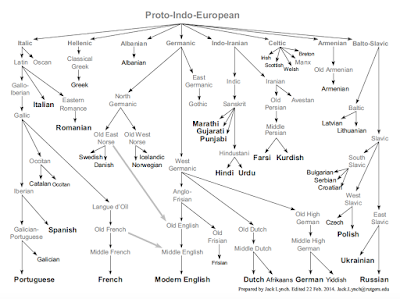 Here’s a fairly simple “family tree” of the Indo-European languages from Rutgers University, showing the relationships between tongues as seemingly-unrelated as Italian and Polish, Welsh and Sanskrit; you can see English evolving out of German. Bet you didn’t know we had so many cousins! Analyzing enough languages far enough back in history, we find some very diverse early languages with common material. This suggests that there were related tribes of early peoples who spoke a parent language that gave us many of the modern world’s languages. But there’s very little archaeological evidence for their existence. In fact, the earliest evidence for Proto-Indo-Europeans, and the bulk of what we know today, comes from the language material they left us in later languages. It’s only been since the 1950’s that the scant, new physical evidence from proposed sites for these peoples has been able to bear on the study at all. We don’t have a lot of artifacts or positive identification for sites where Proto-Indo-Europeans lived. They didn’t even have writing, so our knowledge of their language is only based on reconstruction from second hand material. Yet their existence is universally acknowledged, and has been for centuries, and that consensus is on the strength of linguistic evidence. 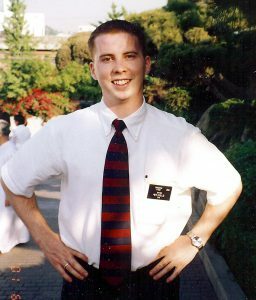 Someone wanting to discount the veracity of the Book of Mormon because most of what we know about its origin is textual rather than archaeological should reconsider their critical criteria. Textual, linguistic evidence is real. It’s scientific. It counts. While fans of President Obama assured outraged parents that the executive decree on bathroom policies was nothing to worry about, the reality of males entering women's bathrooms or locker rooms at will has already led to harm in some quarters. Parents are right to worry about the safety of their children in such an environment. But with unrestrained leaders putting political correctness above child safety, many are finally considering home schooling as the best option for the welfare of their kids. Unintentionally, radical federal policies overriding sensible solutions from local schools and local school boards have given a big boost to home schooling. Fortunately, those exploring their options in home schooling are finding that it can also greatly advance the education of their children. The exciting news about home schooling is that there is a vibrant community of home schoolers who are working together to solve the problems of curriculum, socialization, physical education, teaching tough new topics like foreign language, preparing kids for college, and so forth. I've talked with some home schoolers recently and have been inspired by what they are finding. Ordinary kids from ordinary parents seem to be capable of much more than most of us ever thought. Reading at advanced levels, digging into history and science with zeal, and learning to love learning does not require Einstein-like gifts. The gifts are often already there. They just need to be taught well. One resource my wife has been reading is the blog Meliahl.com from a mom who has been helping a lot of other parents in her community solve problems and learn to reap the huge benefits that home schooling can bring. It's a lot of work, but the educational results have been amazing, and her kids can have the privacy and safety they deserve. If you're homeschooling or thinking about it, take a look at Meliahl.com and the resources she recommends. Latter-day Saints have long been encouraged to prepare for tough times by having food storage and basic supplies as well as some savings. Once again, I wish to recommend that your savings include cash that you can live of when things go bad. Part of the problem is that the available currency for US dollars is less than 10% of the total amount of dollars that have been created through America's great credit bubble, meaning that when people feel nervous, the ATM machines will quickly be emptied and the banks won't be able to give you your money. That may just be a short-term problem that can be remedied eventually with the help of emergency printing of bills by authorized or unauthorized counterfeiters with the help of the paper and printing industries. But there is an even bigger and more serious long-term problem: the banks you trust with your money can't be trusted, as Wells Fargo has just illustrated (more on that below). And even if they are trying to be trustworthy, the US government can't be trusted, and it may suddenly feel justified in freezing, blocking, or just snatching your funds. Money in the bank may not really be there in the end. So having significant cash on hand or somewhere relatively safe is one way of preparing for the bubbles that are bound to pop. Cyr goes on to quote the official response of an executive at Wells Fargo who explains that the CEO who was in charge when all this fraud took place, a woman who has suddenly resigned and is walking away with more cash in a giant parting bonus than you and I could ever haul in the biggest wheelbarrow you've ever seen, was a great gal and helped the stock go up, up, up. Hurrah! So Wells Fargo has changed, wiped the slate clean, and will be much more careful in the future -- careful not to get caught, I'm sure. 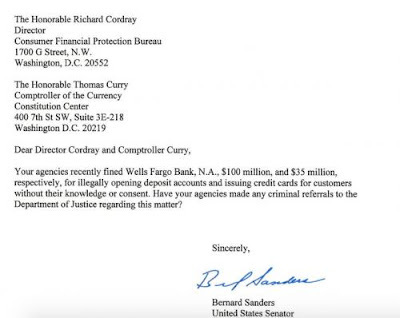 When major violations of US law can take place that are simply ignored by the enforcers, apparently because a company or VIP is to "too big to fail, too important to jail," we are no longer living under the rule of law. It's a symptom of a Gaddiantonized society and a sign of very big trouble to come. Those little slips like this one that get public scrutiny are usually the tip of a very sinister iceberg. Whatever you think you have in the bank, remember that all those nice little intangible electronic digits consisting of 1s and 0s, can easily become a nice long string of 0s with the flipping of a few bits. Easier still, the bank can simply be put on a "banking holiday" as one of the great thieves of the past already did during a time of economic crisis in the US (the same thief who forced Americans to turn their gold over to the US government for $20 an ounce when the price would be $35 an ounce for the rest of the world). Be prepared for ugly surprises far more serious than paying a lot of spurious fees to Wells Fargo. 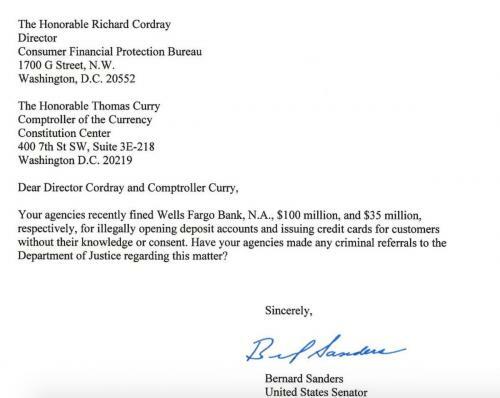 You can't trust your bank, or the people who control and regulate your bank, and the people whose primary loyalty is to the bankers of Wall Street, not the US Constitution. The last item in his list may be a stretch and is easy to criticize. Nevertheless, it is at least possible that Mark saw significance in the number seven when choosing to mention that detail. If the frequent theme of casting out demons in Mark was viewed as an analog to the casting out of pagan nations in Israel as part of God's New Exodus through the ministry of Christ, perhaps Mark felt the number was significant, but it is simply speculation. In looking at the parallels Lunn sees in the ending of Mark with the appearance of Christ and His commission to the Apostles, I wondered if anything similar might be happening in 3 Nephi with the appearance of Christ to Book of Mormon peoples. Exodus themes are strongly present in the Book of Mormon, though most strongly in the writings of Nephi. Alma the Younger, clearly a devoted student of the brass plates, also uses Exodus themes in his writings. But do we find that in the 3 Nephi account of Christ's appearance and ministry in the New World? When we turn to 3 Nephi, the need and the effort to recover those who were captives of sin becomes clear. The principal differences, of course, were that (a) the risen Jesus, the one who sought the recovery, came in person rather than sending a messenger, and (b) there was no captor to whom he needed to present his credentials. In this connection, important features of Jesus’ visit grew out of the scene in which he presented his “credentials” and the tokens of his mission to those whom he sought to rescue. Note the following overtones in the wonderful moments just after his arrival: “Behold, I AM Jesus Christ whom the prophets testified shall come into the world. And behold, I AM the light and the life of the world” (3 Ne. 11:10–11, capitalization added). The similarities with Moses’ situation cannot be missed. In the first instance, Jesus identified himself as the one whom the gathered crowd had been expecting. Moses, too, had to identify himself as the envoy of Israel’s God (Ex. 4:29–31). Further, Jesus announced himself specifically by using the divine name I AM, the same name which Moses carried from his interview on the holy mount (3:14). Additionally, as Moses had carried at least one token of his commission which had the form of a physical malady, namely, his arm which could be made leprous (4:6–8), so Jesus bore the tokens of his crucifixion in his person. Moreover, to demonstrate the validity of his wounds, Jesus asked the entire crowd of twenty-five hundred people (3 Ne. 17:25) to come forward so that “ye may thrust your hands into my side, and also that ye may feel the prints of the nails in my hands and in my feet” (11:14). My last point in this context is that as the children of Israel had “believed” Moses and had then “bowed their heads and worshipped” (Ex. 4:31), so the people in Bountiful, after “going forth one by one . . . did know of a surety and did bear record, that it was he, of whom it was written by the prophets, that should come” (3 Ne. 11:15). They too “did fall down at the feet of Jesus, and did worship him” (11:17). And like the scene in which worship was extended to Jesus who was present, the Israelite slaves worshiped the Lord who “had visited the children of Israel” (Ex. 4:31). Item 8 dealing with the "hardness" of hearts is not clearly present in the context of Christ's ministry, though in 3 Nephi it is referenced as a key factor associated with the wickedness of the people before the great destruction in 3 Nephi 9. As reported in 3 Nephi 1:22, "there began to be lyings sent forth among the people, by Satan, to harden their hearts, to the intent that they might not believe in those signs and wonders which they had seen; but notwithstanding these lyings and deceivings the more part of the people did believe, and were converted unto the Lord." Here the hardening of hearts under Satan's influence leads to disbelief of the signs and wonders they saw that were pointing to the coming of Christ. Then 3 Nephi 2:1-2 again reports that the people "began to be hard in their hearts, and blind in their minds, and began to disbelieve all which they had heard and seen," ascribing signs and wonders from God to the works of Satan or the deception of men. Further, in 3 Nephi 21, in speaking of a sign to be given in the latter days regarding the gathering of Israel, Christ states that the Gentiles may be counted among His people "if they will not harden their hearts," and in the following verse He observes that the His prophecies about the gathering of Israel in the last days "shall be a sign unto them [the Gentiles]" (3 Nephi 21:7). These passages link hardness of hearts to disbelief of divine signs, which is what we find in several verses in Exodus. For example, in Exodus 4:21, "the Lord said unto Moses, When thou goest to return into Egypt, see that thou do all those wonders before Pharaoh, which I have put in thine hand: but I will harden his heart [the JST has "Pharaoh will harden his heart"], that he shall not let the people go." The hardened heart does not believe and obey in spite of signs. Later in Exodus 7:3-4, the Lord tells Moses that "I will harden Pharaoh’s heart [also changed to Pharaoh will harden his heart" in the JST], and though I multiply my signs and wonders in Egypt, he will not listen to you" (NIV). Item 9, as mentioned (casting out seven nations/seven demons), may be a weak element in Lunn's analysis and is not found in 3 Nephi. However, the Exodus theme of casting out pagan nations to prepare the way for Israel not only has parallels to Christ's casting out demons in Mark as part of a new Exodus, but also has links to 3 Nephi, where the theme of a New Exodus is also present. This New Exodus, unfortunately, appears to requiring casting out portions of a pagan Gentile nation in the New World, as described in 3 Nephi 20:15-22 and 21:12-24. The words Christ uses makes the ties to the Exodus particularly strong, for he introduces the concept after declaring that "this land" in the New World was given unto the Nephites/House of Israel for an inheritance (3 Nephi 20:14), and then begins the warning to the Gentiles on this land (3 Nephi 20:15-22), among whom the remnant of the House of Jacob shall be "as a lion among the beasts of the forest, and as a young lion among the flocks of sheep" (vs. 16), which is quoting Micah 5:8, but also making reference to Numbers 23:22-24, where Balaam prophecies that Israel, as it had left Egypt and was entering its promised land, would "rise up as a great lion, and lift up himself as a young lion: he shall not lie down until he eat of the prey, and drink the blood of the slain" (vs. 24). This lion/young lion combination is repeated in a similar context in 3 Nephi 21:12. The future gathering of Israel, coupled with some degree of scattering of Gentile peoples that reject the Gospel, is part of the New Exodus of the last days and is rich in parallels to the original Exodus. George S. Tate, “The Typology of the Exodus Pattern in the Book of Mormon,” in Literature of Belief: Sacred Scripture and Religious Experience, ed. Neal E. Lambert (Provo, UT: Religious Studies Center, Brigham Young University, 1981), 245–62. "Should the Longer Ending of Mark (Mark 16:9-20) be in the Bible?," KJV Today. This article shows pages from the two earliest extant manuscripts to illustrate that the scribes appeared to be aware of a longer ending as a possibility they were at least temporarily excluding.